Good quality plants shipping was less than optimal. Due to its delicate beauty, Kousa Dogwood Tree is a lovely addition to landscapes and gardens. Stunning star-shaped blooms and layered branches catch the eye. Hardy in Zones 5-8, this ornamental grows up to 25 feet at a rate of one to two feet per year. It requires full sun to partial shade and average moisture in well-drained acidic, rich, sandy, and clay soils. Kousa Dogwood Tree Flowers Bloom white clusters of bracts from mid-Spring to Summer and also grow Red Berries that grow to about 2cm to 3cm in diameter and can grow larger towards the end of the season. The Berries are edible and taste very sweet. It is very tolerant to Drought and Restricted Water Conditions. Kousa Dogwood is also resistant to Dogwood diseases such as Anthracnose Disease which is caused by a Fungus. This is a beautiful dogwood tree for gardens and also lawns. 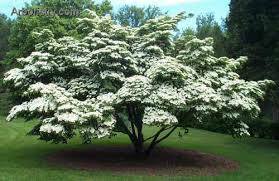 Kousa Dogwood Tree also works great on extensive landscaping projects. It grows to be fifteen to thirty feet tall and also twenty to twenty-five feet wide. During the spring it is covered with gorgeous white flowers that give way to berries. The berries are loved by squirrels and also a variety of birds. Kousa Dogwood Tree provide beautiful color and even a beautiful appearance to all locations where they are planted. These trees also make great borders for lawns as they grow to maturity. These are a great addition to landscaping a lawn and makes a yard stand out amongst the rest when they are in bloom. Kousa Dogwood Tree trunks of these trees are thin, but they are also solid and hardy trees. They withstand winds and also storms very well. The leaves of this tree turn a dark red or burgundy during the fall months and look amazing. Kousa Dogwoods are quickly grown and a great way to supply a gorgeous look to natural areas and also a large flower garden.